صادقی طبس, صادق, پوررضا بیلندی, محسن, تقیان, مهرداد. (1394). بهینه‌سازی چندهدفه مدل جیره‌بندی بهره‌برداری از مخزن با استفاده از الگوریتم‌های هوشمند. مجله آب و فاضلاب, 26(5), 14-22. صادق صادقی طبس; محسن پوررضا بیلندی; مهرداد تقیان. "بهینه‌سازی چندهدفه مدل جیره‌بندی بهره‌برداری از مخزن با استفاده از الگوریتم‌های هوشمند". مجله آب و فاضلاب, 26, 5, 1394, 14-22. صادقی طبس, صادق, پوررضا بیلندی, محسن, تقیان, مهرداد. (1394). 'بهینه‌سازی چندهدفه مدل جیره‌بندی بهره‌برداری از مخزن با استفاده از الگوریتم‌های هوشمند', مجله آب و فاضلاب, 26(5), pp. 14-22. صادقی طبس, صادق, پوررضا بیلندی, محسن, تقیان, مهرداد. بهینه‌سازی چندهدفه مدل جیره‌بندی بهره‌برداری از مخزن با استفاده از الگوریتم‌های هوشمند. مجله آب و فاضلاب, 1394; 26(5): 14-22. مسائل بهره‌برداری از مخزن دارای اهداف مختلف و متنوع هستند که به ندرت منتهی به یک جواب بهینه می‌شوند و معمولاً در آن‌ها مجموعه‌ای از جواب‌های بهینه (پارتو) موجود است. حل این گونه مسائل در گذشته تنها با کاربرد روش‌های ساده کننده میسر بوده است که از آن جمله می‌توان به استفاده از ضرایب وزنی برای اهداف مختلف و تبدیل آن‌ها به یک تابع هدف استفاده کرد. اما در سال‌های اخیر با توسعه الگوریتم‌های چند هدفه تکامل‌گرا، ابزار مناسبی برای حل آن‌ها فراهم شده است. یکی از مسائل کلاسیک در این مدل جیره‌بندی بهره‌برداری از مخزن است که کاربرد آن برای کاهش اثرات خشکسالی در مدیریت منابع آب بسیار متداول است. 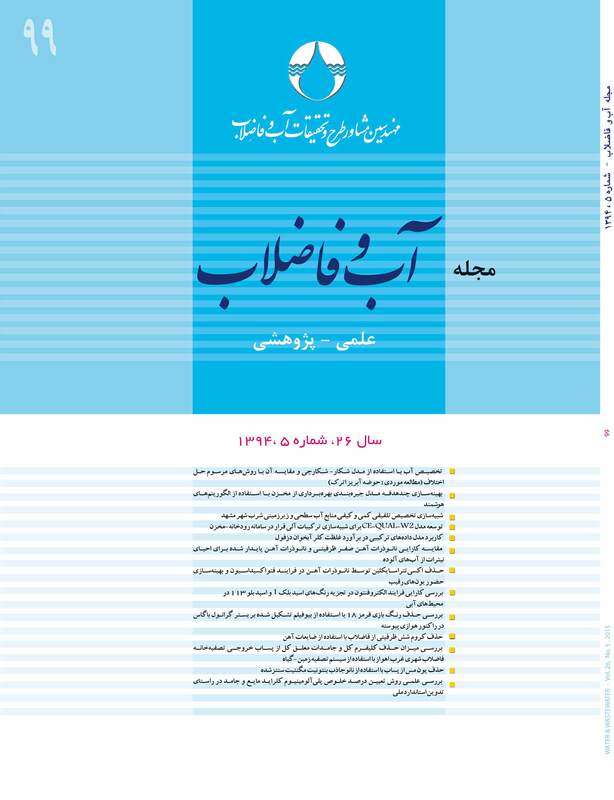 در تحقیق حاضر بهینه‌سازی چند هدفه مدل جیره‌بندی با استفاده از الگوریتم‌های NSGA-II،MOPSO ، SPEA-IIو AMALGAM انجام شد. در این راستا، یافتن مقادیر بهینه ضرایب جیره‌بندی سد طالقان در یک دوره آماری 35 ساله آبدهی و با دو هدف کمینه نمودن شاخص اصلاح شده کمبود و بیشینه نمودن شاخص اعتمادپذیری (دو هدف متناقض با یکدیگر)، در دستور کار قرار گرفت. نتایج نشان داد دوره جیره‌بندی در ماه‌های فصل گرم (نیمه اول سال) است که مقادیر KP مربوط به همه آن‌ها را بیشینه نمود. مقادیر KP در ماه‌های سرد نیز به سمت کمترین مقدار پیش رفته که در حقیقت نزدیک شدن به همان سیاست SOP را در پی خواهد داشت. همچنین در این تحقیق کارایی الگوریتم‌های مذکور برای ارائه دامنه وسیعی از جواب‌های بهینه مشاهده شد. Multi-objective problems rarely ever provide a single optimal solution, rather they yield an optimal set of outputs (Pareto fronts). Solving these problems was previously accomplished by using some simplifier methods such as the weighting coefficient method used for converting a multi-objective problem to a single objective function. However, such robust tools as multi-objective meta-heuristic algorithms have been recently developed for solving these problems. The hedging model is one of the classic problems for reservoir operation that is generally employed for mitigating drought impacts in water resources management. According to this method, although it is possible to supply the total planned demands, only portions of the demands are met to save water by allowing small deficits in the current conditions in order to avoid or reduce severe deficits in future. The approach heavily depends on economic and social considerations. In the present study, the meta-heuristic algorithms of NSGA-II, MOPSO, SPEA-II, and AMALGAM are used toward the multi-objective optimization of the hedging model. For this purpose, the rationing factors involved in Taleghan dam operation are optimized over a 35-year statistical period of inflow. There are two objective functions: a) minimizing the modified shortage index, and b) maximizing the reliability index (i.e., two opposite objectives). The results show that the above algorithms are applicable to a wide range of optimal solutions. Among the algorithms, AMALGAM is found to produce a better Pareto front for the values of the objective function, indicating its more satisfactory performance. 1. Emadi, A. R., and Khademi, M. (2011). “Reservoir operation rule curve of doroodzan dam using yield model.” J. of Water and Soil, 25(5), 1058-1068. 2. Oliveira, R., and Loucks, D. (1997). “Operating rules for multi-reservoir systems.” Water Resource Research, 33(4), 839-852. 3. Bower, B.T., Hufschmidt, M. M., and Reedy, W. W. (1962). Operating procedures: Their role in the design of water-resource systems by simulation analyses, Design of Water Resourse Systems, Harvard University Press, Cambridge, Mass. 4. Louks, D. P., Stedinger, J. R., and Haith, D. A. (1981). Water resourse systems learning and analysis, Prentice-Hall, Englewood Cliffs, N. J. 5. Yeh, W. W. G. (1985). “Resource management and operation models: A state-of-the-art review.” Water Resource, 21(12), 1797-1818. 6. Shiyang-shih, Jh., and Revelle, Ch. (1994). “Water-supply operations during drought continuous hedging rule.” J. of Water Resources Planning and Management, 120(5), 613-629. 7. Dandy, G. C., Connarty, M. C., and Loucks, D. P. (1997). “Comparison of methods for yield assessment of multiple reservoir systems.” J. of Water Resources Planning and Management, 123(6), 350-358. 8. Dahe, P. D., and Srivastava, D. K. (2002). “Multireservoir multiyield model with allowable deficit in annual yield.” J. of Water Resources Planning and Management, 128 (6), 406-414. 13. Eder, G., Duckstein, L., and Nachtnebel, H. P. (1997). “Ranking water resource projects and evaluating criteria by multicriterion Q-analysis.” J. of Multi-Criteria Decision Analysis, 6(5), 259-271. 14. Gill, M., Kaheil, K., Khalil, Y. H., McKee, A., and Bastidas, L. (2005). “Multiobjective particle swarm optimization for parameter estimation in hydrology.” Water Resource Research, 42 W07417, doi: 10. 1029/WR004528. 15. Reddy, M. J., and Kumar, D. N. (2007). “Multi-objective particle swarm optimization for generating optimal trade-offs in reservoir operation.” Hydrological Processes, 21, 2897-2909. 16. Baltar, A. M., and Fontane, D. G. (2008). “Use of multiobjective particle swarm optimization in water resources management.” ASCE Journal of Water Resources Planning and Management, 134(5), 265-275. 17. Liu, Y. (2009). “Automatic calibration of a rainfall-runoff model using a fast and elitist multi-objective particle swarm algorithm.” Expert Systems with Applications, 36, 9533-9538. 18. Mohammadrezapour Tabari, M., and Soltani, J. (2013). “Multi-objective optimal model for conjunctive use management using SGAs and NSGA-II models.” Water Resources Management, 27 (1), 37-53. 21. Maass, A., Hufschmidt, M. M., Dorfman, R., Thomas, Jr., Marglin, S. A., and Fair, G. M. (1962). Design of water-resource systems, Harvard University Press, Cambridge, Mass. 22. Hsu, N.S., and Cheng, K.W. (2002). “Network flow optimization model for basin-scale water supply planning.” Water Resources Planning and Management, 128(2),102-112. 23. Chang, J.F., Chen, L. and Chang, C.L. (2005). “Optimizing reservoir operating rule curves by genetic algorithms.” Hydrological Processes, 19, 2277-2289. 24. Tu, M.Y., Hsu, N.S., Tsai, F.T.C., and Yeh, W.W.G. (2008). “Optimization of hedging rules for reservoir operations.” Water Resource Planning and Management, 134(1), 3-13. 27. Deb, K., Agrawal, S., Pratap, A., and Meyarivan, T. (2000). “A fast elitist non-dominated sorting genetic algorithm for multi objective optimization: NSGA-II.” Indian Institute of Technology, Kanpur, India. 28. Parsopoulos, K.E., and Vrahatis, M.N. (2002). “Particle swarm optimization method in multiobjective problems.” Proceedings of the 2002 ACM Symposium on Applied Computing, Madraid, Spain. 603-607. 30 Vrugt, J. A., and Robinson, B. A. (2007). “Improved evolutionary optimization from genetically adaptive multimethod search.” Proc. Natl. Acad. Sci. U.S.A., 1043, 708-711.